A large balancing lake in the northeast of Milton Keynes. The lake is in two parts – the North Basin is a wildlife reserve with an island for nesting birds. The South Basin is primarily for water sports but attracts large numbers of overwintering birds, particularly gulls. The lake covers an area of approximately 40 hectares (100 acres) and it is one of the largest, purpose-built balancing lakes in Britain. The main function of the lake is to collect water from the surrounding area. In times of excess rainfall, the control of water flowing into the River Ouzel is important to prevent flooding further downstream. The redways and leisure routes around the lake are very popular with runners, dog walkers and other recreational users including fishermen. Both lakes are easily accessible on hard surfaces around their circumference. Originally farmland, the basin for Willen Lake was excavated in the 1970s to provide part of the balancing system to control the flow of run-off into the River Ouzel. During these works the river was diverted and sluices and weirs constructed. The lake was designed with variable depth of water – deeper to allow for fish swims as well as shallower areas, which would be exposed as banks in drier spells. In general, the south lake is deeper than the north lake. The lake and surrounding park are managed by The Parks Trust. Anglian Water is responsible for managing the level of the water. 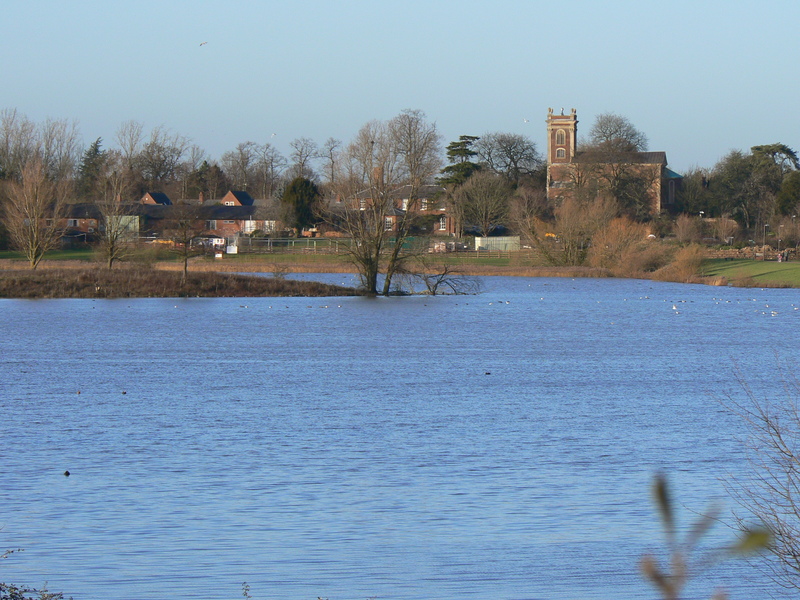 From the banks of the north lake, Willen church is visible. This is a 17th century early English Baroque church designed by Robert Hooke. Also by the north lake is the Peace Pagoda built in 1980 by the monks of the Nipponzan-Myohoji Buddhist temple. The temple itself is nearby. A wide variety of species can be seen here at different times of the year, but Willen Lake is particularly noted for its birdlife. Variable mowing regimes, particularly around the less formal north lake, allow the flowering of wild plants such as Common Bird’s-foot-trefoil. The area just west of the bird hide is particularly rich in wild flowers and attracts numbers of butterflies and damselflies in summer. The muddy margin of the island in the North Basin is the only known Buckinghamshire site for the nationally rare Grass-poly. It may have arrived on the feet of visiting ducks! Otter signs are often seen along the neighbouring River Ouzel and, from time to time, otters themselves might also be observed in Willen Lake itself, generally in winter. A large half eaten carp on the pathway is usually a sure sign that otters are hunting in the lake. Willen Lake is a good place to see bats. During recent work on the church roof, six species of bat were recorded. Throughout the year significant numbers of water birds are to be seen on both lakes. There is a public bird hide on the south bank of the north lake which gives views over shallow water and the bund between the lakes to the large island with a chance to see Kingfisher. In summer, the north lake and its reed bed provide habitat for Sedge Warbler, Reed Warbler and Water Rail. Several other types of warbler are also summer visitors and there have been regular records of Cetti’s Warbler. Common Tern nest on the bund and nesting rafts. House Martins have made a colony on the lakeside buildings of the south lake. In winter, migrating birds include Widgeon and Goldeneye. There is a large gull roost, generally on the south lake. Goosander are regular visitors. Starling murmerations are known to occur over the north lake, generally in the weeks leading up to Christmas. The hide is a good place from which to see Snipe. In spring, interest is provided by the heronry on the south side of the island. Both Grey Heron and Little Egret nest there. Both spring and autumn provide opportunities to see passage migrants – Wood Sandpiper and Hobby, for example. Other waders may be present, depending on water levels on the north lake. Past sightings have included Wilson’s Phalarope and Avocet. Grass Snakes are frequently seen around the north lake, mainly near the reed bed. An upturned willow root plate near the Nipponzan-Myohoji Buddhist temple has for many years provided a nest site for Hairy-footed Flower Bees. A warm late spring afternoon is the best time to observe these solitary bees. Willen Lake in located in the northeast area of the city and is bounded by the V10 (Brickhill Street), Milton Road, the V11 (Tongwell Street) and the H5 (Portway). For those arriving by car, free parking is available at Willen Pavilion off Portland Drive and off the V11 (Tongwell Street), just north of the junction with the H5 (Portway). Pay and display parking is available off the V10 (Brickhill Street) at Willen Lake South Basin, between the H6 (Childs Way) and the H5 (Portway) (two large and popular carparks) and the Pagoda car park, also off Brickhill Street but north of the H5 Portway. The lake is well served by Redway cycle routes to Milton Keynes City centre and along grid roads to north and south. Sustrans cycle route 51 skirts the South basin. The number 300 bus from Central Milton Keynes Station (bus stop Y2) or from the Point (bus stop L3) is the most frequent daily service that passes fairly close to the Lake (timing varies between every 15 minutes to hourly until late evening). Alight at Lovat Fields Retirement Village on the H5 Portway, close to the Pagoda Roundabout. Walk towards the Pagoda to reach the North Basin and the main areas for bird watching and the bird hide. The number 40 and 52 buses also serve this stop, but run less frequently. The Peace Pagoda – the first to be built in western Europe. One thousand Japanese cherry trees have been planted on the hillside above the pagoda. On the north lake are also found the Medicine Wheel, The Labyrinth and Willen Hospice. Refreshments and food are available at various outlets by the South Basin.